jakashra has no other items for sale. 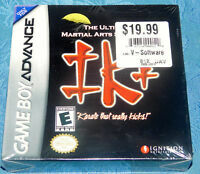 GAME BOY GAMEBOY Advance GBA IKT Ultimate Martial Arts Simulation SEALED NEW!! 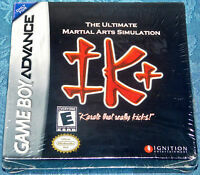 IK+, short for International Karate Plus, is a Game Boy Advance port of a computer game released in the late '80s across various formats. As one of three martial artists dressed in red, white, or blue, players attempt to score five hits on the other two characters before they do the same. Each round lasts 30 seconds and each successful hit earns the character points, with the top two players advancing to the next round in a quest to receive the coveted black belt in karate. In between levels are bonus stages that involve blocking balls or bombs with a shield. The action in each round takes place in the same locale with the same three fighters, two of which are controlled by the computer. A friend can join in for simultaneous play using a Game Link Cable.